Keyword research is the process of researching the actual search terms that consumers enter into search engines. It is a vital, and often overlooked, part of any SEO, online advertising, or content marketing strategy. Tailor your website’s content to better rank for important consumer search terms (aka search engine optimization, or SEO for short). 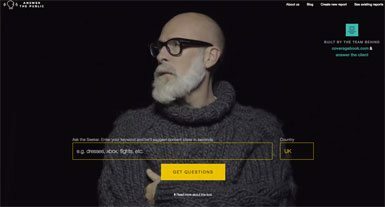 Design more compelling online advertisements built around key search terms. Improve your content marketing by allowing you to build blog posts around common consumer questions. Post more engaging content on social media. In this article, we will break down step by step how you can build keyword list that will improve almost any of your online marketing efforts. In part 2, we discuss how to pick the keywords that will bring you the most value. Keyword research should always begin by segmenting your business into broad topics. 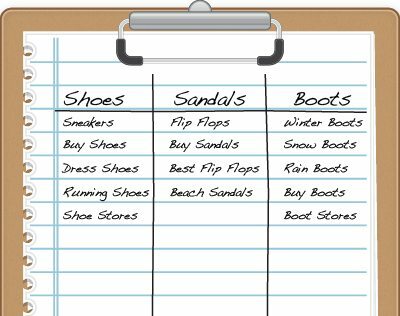 For example, If you own a shoe store you might pick “shoes”, “sandals” and “boots” as the main topics for your keyword research. These topics will become the start of your keyword lists. If your chosen topic has any common synonyms or abbreviations, add them as well. For example, you might add synonyms such as “sneakers” to the “shoes” keyword list and “flip flops” to the “sandals” keyword list. Adding these synonyms allows you to build larger keyword lists and catch all of the consumer searches in your industry. Once you have your top level keywords separated into lists of related terms, you can begin to fill out these lists further by adding keyword phrases built around those top level keywords and their synonyms. These keyword phrases will be what you think your consumers are searching for. Taking our shoe example from earlier we might come up with a list of keyword phrases that include terms such as “buy shoes”, “best shoes”, “local shoe stores” and “running shoes”. Your keyword list will now look something like this. The point of this is not to come up with a full list of every possible keyword phrase. The goal so far is simply to give you a good starting point. Your lists should now contain all of the keyword phrases that you can think of. Now we’ll search for all of the keywords that you can’t think of! When you’re struggling for new keyword ideas, a great place to find them is Google. Simply enter one of the keywords from your list into Google and scroll to the bottom of the results page. Here you will see a list of related search terms. These are common consumer searches that are directly related to the keyword phrase that you entered. Add any relevant terms to your keyword list. You can then enter some of those keyword phrases into Google and look at their related searches. Keep going until the suggestions are no longer relevant to your original topic. Google related search terms box. If you have a Google Adwords account you should also take advantage of Keyword Planner. 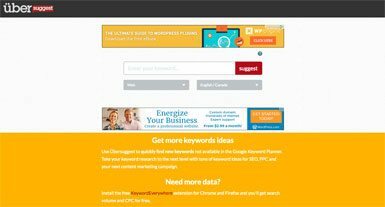 Keyword Planner is a free keyword research tool offered by Google. While originally developed to help advertisers find new keywords for their advertising campaigns, Keyword Planner is also extremely useful for SEO and content marketing. It can be found by first logging in to your Google Adwords account. On the topside menu of Adwords you will notice an icon made up of three vertical dots. Click that icon, then under the “Planning” heading, click “Keyword Planner”. Once there you have three options “Search for new keywords using a phrase, website or category”, “Get search volume data and trends”, and “Multiply keyword lists to get new keywords”. For this article we will focus on the first option. “Search for new keywords using a phrase, website or category” allows you to input keyword phrases from your lists into Keyword Planner. It then gives you a list of suggested keywords related to that phrase. If you only want to see the search habits of consumers in your marketplace, you can also target a specific geographic area. If you’re looking to improve the SEO of a specific webpage you can also input that webpage’s URL into the “Your landing page” field. Keyword Planner will then display a list of suggested keywords based on the content of that page. Compare that list to the list of keywords that you want to rank for. 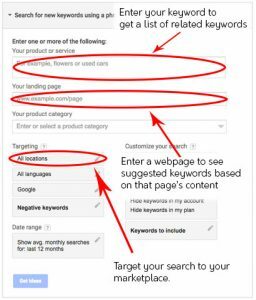 If your desired keywords aren’t on Google’s list, you need to rework the content of that webpage; adding more of the keywords that you want to rank for. At this point, your keyword list will largely be made of phrases between one and three words in length; commonly called head terms. We will now turn our attention to keyword phrases that are four or more words in length; known as long-tail keywords. Since head terms are short and non-specific they typically get searched much more often than long-tail keywords. With traffic comes competition however and head terms can be very hard to rank for. Head terms are also usually searched early in the sales process, before the consumer really knows what they’re looking for. Long-tail keywords, on the other hand, are more much specific than head terms. This means that they are searched for much less than head terms and therefore have less competition. When compared to head terms, this makes them much easier to get rank for. Long-tail keywords are also usually searched farther into the sales process, meaning that they have a much higher conversion rate than head terms. While head terms can each have thousands of searches a day, as a whole they only make up around 30% of total online search volume. The other 70% of searches are long-tail keywords. While each one will only get a few searches a day, the sheer volume of different long-tail keywords means that they make up the bulk of internet searches. To demonstrate this difference let’s consider searches for televisions. A consumer searching for the head term phrase “LED TV” is likely just starting their buying process. A consumer searching for the long-tail keyword phrase “best price on a 30” Samsung LED TV”, however, has already done their research and decided on a 30″ Samsung. They will be making a purchase very soon and are just trying to find the best deal. Looking at their search volumes in Google’s Keyword Planner, “LED TV” has around 246,000 monthly searches worldwide while “best price on 30” Samsung LED TV” has less around 1,000. While “LED TV” will drive much more traffic, it’s conversion rate will be tiny. “Best price on 30” Samsung TV” will hardly generate any traffic. The traffic it does bring, however, will be of a much higher quality. In an ideal world, your website would be able to rank for both head terms and long-tail keywords. Small business websites, however, rarely have the domain authority to rank for head terms. For this reason, ranking for long-tail keywords should be your focus. So where can you get long-tail keyword suggestions? There on tons of free online keyword research tools that can help. Today we will focus on two of the best; Ubersuggest and Answer The Public. To get long-tail keyword ideas from either of these tools, simply enter some keywords from your lists. They will then output a list of commonly searched long-tail phrases that include the keyword that you entered. Along with this basic functionality, both of them also include other keyword finding tools. Answer The Public also includes a list of the most common questions related to your chosen keyword. Ubersuggest offers a word cloud so you can easily see what words are most commonly searched with your chosen keyword. Keyword research is a very valuable skill to have. It is vital to the online success of small businesses. 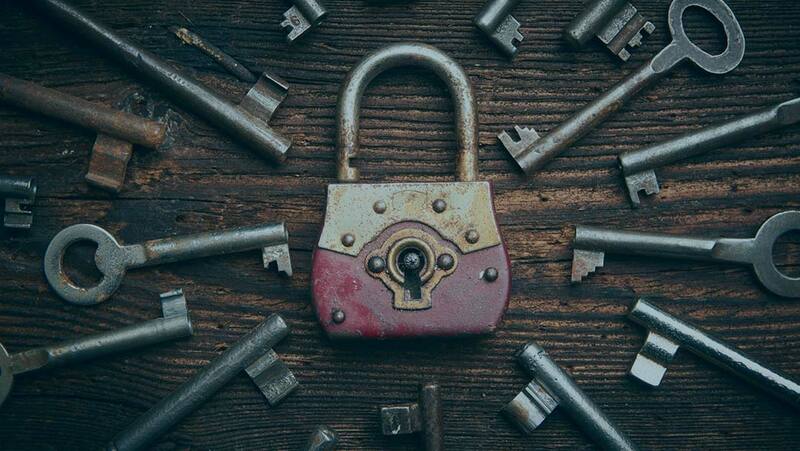 Properly optimizing your website’s content for the right keywords can be the difference between people finding your website and not finding your website. Knowing what consumers are searching for can be the difference between a successful and an unsuccessful advertising campaign. Armed with a better understanding of what your customers are searching for you can now craft your social media posts, sales pitches, brochures and more to better meet their needs. You should now have a fairly long list of potential keywords that you can use to improve your SEO, online ads and content marketing. Which ones should you focus your marketing efforts on? That all depends on how valuable the keywords in your list are. Now that you have a complete list, it’s time to start choosing which ones will help grow your business, and which ones will just waste your time.